When we began writing our first DBQs in the late 1990s, the goal was to create units that were accessible to a broad range of high school students. In the early 2000s, with the writing of our US History Mini-Qs, we broadened the reach to include middle school. Our big discovery in the last few years is that appropriately designed Mini-Qs can be handled beautifully by elementary students! At its heart, a DBQ, or its shorter cousin the Mini-Q, consists of a question, a contextual background essay, and several documents. From observing fourth and fifth-grade students in Florida and California, second graders in central Michigan, and kindergarteners in Oostburg, Wisconsin, we have learned that young school children are capable of evidence-based thinking and writing. 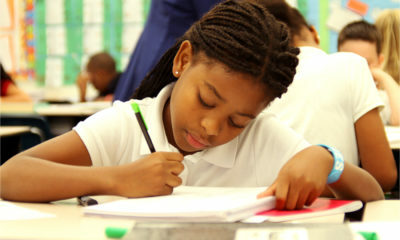 In fact, in the hands of a trained teacher, these kids can thrive on it. Elementary school kids are capable of writing a coherent multi-paragraph essay. The key is the magic of bucketing. And DBQs teach bucketing. Elementary students, like everyone else on the planet, read and comprehend best when they have a clear purpose for their reading. Examining a document is all about reading to answer a question that is firmly in mind. Another compelling reason for teaching DBQs in elementary school is that it binds the elementary curriculum to the middle school and high school curriculum. This vertical integration makes elementary, middle, and high school teachers true colleagues. Our Mini-Qs have received rave reviews from teachers and students alike. 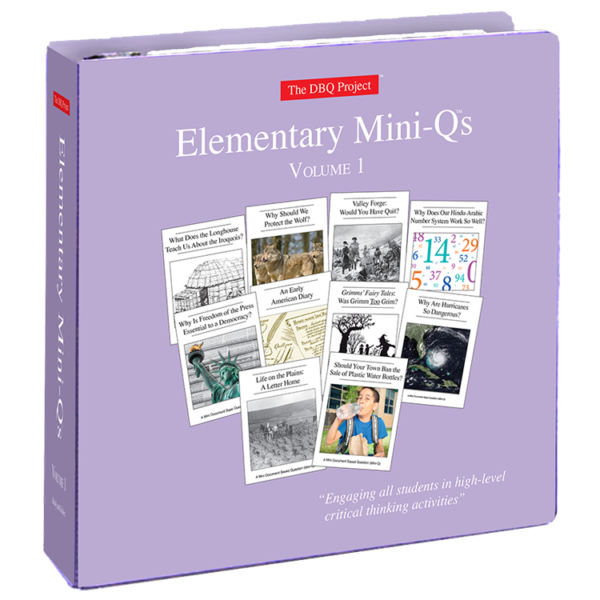 Now, we’re proud to introduce our brand new Elementary Mini-Qs! Complete with ten high-interest units of study, this binder is perfect for younger students. Why Should We Protect the Wolf? Valley Forge: Would You Have Quit? Why Does Our Hindu-Arabic Number System Work So Well? Why Is Freedom of the Press Essential to a Democracy? Grimm’s Fairy Tales: Was Grimm Too Grim? What Makes Hurricanes So Dangerous? Should Your Town Ban the Sale of Plastic Water Bottles? Interested in implementing Elementary Mini-Qs in your district? Order them today! © Copyright 2019 DBQ Project. All Rights Reserved.